Thinking about a trip with friends and family to Vienna? Group Travel to Austria is a great way to see one of Europe's most beautiful countries and at the same time have some memorable travel experiences. A vacation here is guaranteed to be good, from Vienna's cosmopolitan atmosphere to hiking and exploring in the hills of Austria's beautiful countryside. If you have enough people travelling together on a single trip, you will be able to access discounts on your group travel to Austria. Additionally, as the trip organizer, you may have the option of travelling for free, depending on the size of your group. One common mistake that groups make is having a single, "one size fits all" travel plan. While that might be easier to plan, it is best to craft a very flexible itinerary which allows for a structured time together (think meals, organized tours, etc.) and time for each person to select the activities they'd prefer. So, the folks who want to sleep in can and the others who want to catch sunrise on the top of the mountains can, and everybody's happy sharing their experiences at the end of the day. A good group itinerary can handle all that and more. It is important to choose the right travel professional to help you create that perfect group plan. Someone who has specific knowledge on all the great places to see in Austria is one thing, but someone who's actually created plans and led groups in Austria can help you understand the specific nuances and make the connections to those who offer groups perks and discounts. Spend two weeks extensively exploring some of Europe's most beautiful landscapes. 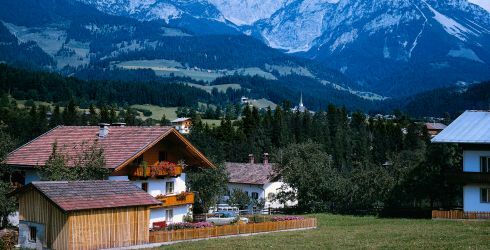 This pleasantly-paced yet interesting itinerary will begin in Munich and take you from Bavaria into Austria, a Mecca of classical music, amazing Alpine views and pinot noir wines. You'll then travel into Switzerland, a country whose dramatically-stunning geography has no equal. With lakes, mountains, delicious food, charming villages and expert sightseeing, spend two weeks in a picture-perfect, Alpine paradise. View the complete day to day Austria, Germany and Switzerland Itinerary. While Vienna, Prague and Budapest have undoubtedly been influenced by their former Austrian Habsburg rulers, this Central European itinerary will show you that each is absolutely distinct and unique! Vienna oozes classical elegance and houses some of the best museums and classical music venues in Europe. Budapest, a true melting pot of Western and Eastern cultures, is undeniably charming and home to geothermal baths, beautiful architecture and amazing views of the Danube. Prague, with its timeless Old Town and ancient Castle District, possesses an ambience unlike anywhere else in the world. Spend a week and a half getting to know three of Europe's most beautiful capital cities. Inside visits to Hofburg Palace, Prague Castle, Buda Castle and Krivoklat Castle! View the complete day to day The Best of Vienna, Budapest and Prague Itinerary. This 11-day tour was designed to take your group from the banks of the Danube, past the Vienna Woods, through historic Bohemian towns, to a fairytale city found along the River Vltava and lastly to the northern frontiers of the scenic Alps. We guarantee that you cannot find scenery much better than this! If remarkable royal castles, pretty baroque towns, top-notch classical music venues, and out-of-this-world landscapes are on your travel bucket list, this is the itinerary for you! Inside visits to Hofburg Palace, Prague Castle, and Krivoklat Castle! View the complete day to day The Best of Vienna, Prague and Salzburg Itinerary.